Mauritius is about a lot of things: the sea, the sun, dholl-purees, rougaille poisson salé, the séga, Phoenix beer, koz n’importe and, well, picnic dans bis. Since I was a kid, I love going to picnics in a rented bus. 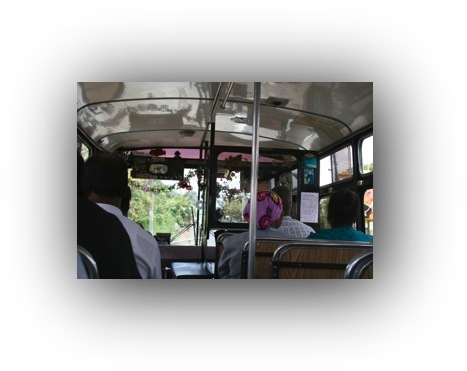 Most of the time, we rent a 60-seats bus and pack it with (i) family (ii) drinks and (iii) food. And, of course, we make sure that all of us coming know (i) how to sing the séga and (ii) drink without, ahem, spilling. As you can guess, I am in an excellent mood right now because I’ll be going on a picnic dans bis very shortly. I hope I’ll manage to capture some nice pictures to share with you. Maybe you briefly saw Christina and myself on TV during the 19:30 news bulletin a few days ago? 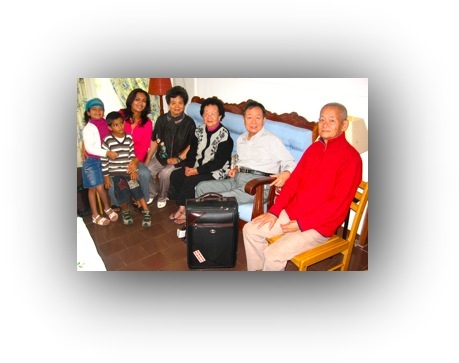 MBC thought that siblings meeting each other after more than 60 years of separation was newsworthy. I tend to agree. How do you say picnic dans bis in Hakka? 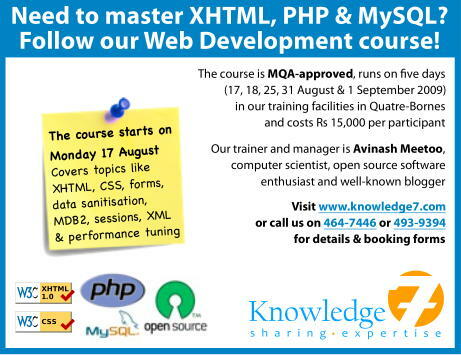 We are going to run a web development course (XHTML + CSS + PHP + MySQL) this month. You’ll find the detailed course content on our website. I’ve just blogged on why I have changed the course schedule. My son, Kyan, is nearly five years old and he has recently developed a liking for those simple games made with Flash technology which now abound on the Web. 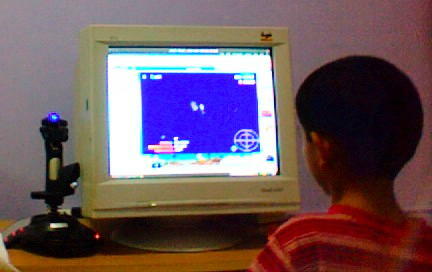 While watching him today while he was playing a simple 2D game involving an F/A-18 shooting on enemy aircrafts, I realised that I did the same thing 20 years ago but, at that time, the game required a dedicated computer (I had an Amiga 500 then.) Now, any computer running any operating system (Kyan is a Linux Mint user!) and featuring a decent browser (Firefox 3) can run similar games while doing a lot of things in parallel.